One of the most asked for features is parking assist retrofit. Cars ordered after August-2013 now have the options for a built in parking assist option, which is a good deal. We’ll show how we installed a system on the Model S that didn’t have the option and some of the tricks to make a clean installation. For this project we decided to install a front parking assist system as the rear sensor installation is a bit more complex to install and wire up. I think the rear camera does a reasonable job at seeing what’s behind you. 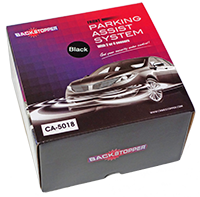 After reviewing the different products available we settled on the BackStopper CA-5018. This offers a small display and audio alert that mounts unobtrusively on top of the rear-view mirror. It displays a progressive lit LED array as you go from 3 feet and closer with separate indicators for left and right sides. The system list cost is $160, but it’s heavily discounted on line for about $70. A few other required parts adds another $25 or so. It took me about 14 hours to install, but some of that was determining the best way to do various operations with the least physical modifications to the Tesla and documenting the process. For someone comfortable working on cars and electrical add-ons, I’d guess the project could be done in less than 8 hours. This project does require drilling a couple of holes in the plastic frunk, and holes for the sensors in the front black plastic front bumper. The BackStopper may come in different colors, so be sure to get black, which is the color of the ultrasonic sensors. The BackStopper allows installation of either 2 or 4 sensors, and includes 4 sensors in the package. I elected to install only two sensors in the black bumper area to avoid the additional complications of removal of the entire front bumper and painting 2 sensors to match the car color. It also makes for a bit cleaner looking front end if you don’t like the look of the extra protrusions. I suggest you read though all our instructions and the manual that came with the parking assist system to be sure you are comfortable with this project. If you elect to pick a different vendor or product, many of these instructions will still apply, but you’ll need to make modifications based on the specific system’s requirements. Like all our projects, you may elect to do the installation differently and see our note at the end for a possible different installation method. We’ll route the wire along the headliner down the passenger side post, out the hinge side of the passenger door and down in front of the passenger front shock where we’ll mount the controller. A slightly cleaner install would go through the firewall, but this could take an extra 5 hours or more, as both sides of the firewall are very difficult to access. Likely the entire dashboard would need to be removed, and on the frunk side, you’d likely need a lift to get access from under the car to the other side of the firewall. My technique avoids all this, but does make the wire viable when you open the passenger door (although I doubt anyone would notice it). The display sits on top of the rear-view mirror. The end result is very professional and looks like it was designed for the Tesla! I didn’t attach the display until I was completely satisfied with the wiring, so hold off on this step until later. You can use a rubber band or two to hold it in place for now. On the passenger post, from the top, snap out the plastic “Airbag” cover about 3/4 of the way up the post. Using a T-24 bit, unscrew the screw that was hidden by the cover. The cover will come out partway, but something was holding it in the bottom. I decided not to pull it out, as you can do the wiring with just the top angled out. Next with the passenger door open, remove the black panel on the side of the dashboard. It snaps out (although the snaps are a bit hard. The long rectangular object on this panel is the FOB sensor. Carefully lay this aside (you can disconnect the wires if needed – I left them attached as the wires are fairly long). 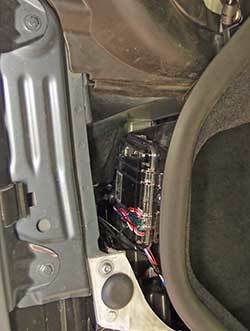 Adjacent to the dashboard panel, below the post is another 2″ wide black cover. with the post loose, you can pull this side part up to unhook it. It should then come right out. Open the frunk. We’ll remove the passenger side cover. First remove the rubber mount about halfway down by unscrewing it. Lift up near the windshield and slide it out away from the frunk. Put the cover aside for now. I elected to also remove the rear-view mirror mount cover (not the mirror itself) so I could hide a couple of inches going up into the headliner. While making it look slightly better, this is much more of a pain than I envisioned, so you may want to just route the wire into the headliner. If you do want to remove the cover, it comes apart at the vertical seam, but if you can, remove only the passenger side. There are four clips and I found it difficult to separate. 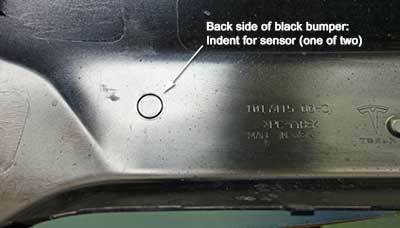 The driver side of the cover is also physically snapped onto the rain sensor. If you can avoid removing that half, you’ll save a lot of effort later. Mirror mount with covers removed. Rain sensor appears on the left. I then filed a small slot for the wire in the front of the casing. 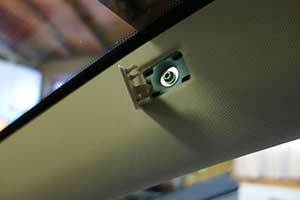 I then routed the wire through the casing up into the headliner and over to the pillar. Later it took me at least 25 minutes to reassemble this as the driver side is very difficult to get back into place. Tip- get the driver’s side cover in place first, it has to fit over the rain sensor perfectly – then slide the passenger side into the drivers side. I was always worried I’d break off the rain sensor or mirror mount as both are just glued to the windshield. The glue they use must be great as I applied a fair amount of pressure trying to get the covers back in place. Leave just enough wire so the mirror can be moved to any position without pulling on the display wire. You can route the wire under the headliner without removing the headliner. 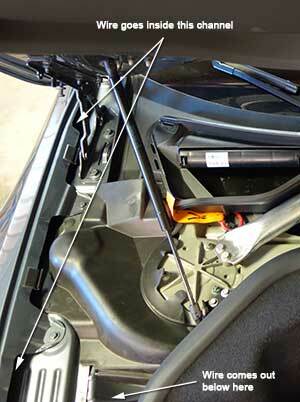 With a plastic tool, you can pull the headliner down 1/16″ or so, enough to push the wire in. Go along the top until you get to the side post. Route the wire down the post. There are two channels. I choose the channel towards the windshield. About 1/3 of the way down, there is a wire route that holds the wire in place. You can also use a tie-wrap in one of the holes to also keep it in place. Feed the wire down into the area where you removed the two black panels. I poked an extra 8″ of wire into the steel tube, just to have a bit extra and to make sure the wire isn’t too tight (optional). Now push the connector/wire end under the rubber door seal and feed it through. I wrapped the wire with electrical tape where it could rub the metal door seam as extra protection. Now there is a nice seam going to the hood lid that is just wide enough for the wire. I fed the wire through a hole in the frame and came out at the side of the frunk where we are going to mount the controller. Realize this area can get wet, but the wire is waterproof, so it should not be a problem. We’re done with the display wiring! Attach the thin black panel first, then the side post and bolt. Lastly snap the black side dashboard panel in place (making sure the FOB antenna is still connected and it’s wires are not pinched). At this point you can mount the display to the top of the mirror with the adhesive tabs already on the display. The black front plastic bumper cover is fairly easy to remove, there are four plastic clips on the bottom that I unclipped first from the hex grill, using a thin plastic blade. With these loose, then just pull out starting at the bottom and the other clips around the sides and top should release. Be careful with this part as it scratches fairly easily. On the inside of my cover there are two round 3/8″ indents that are likely intended for Tesla’s own future sensors. My car’s front steel bumper has holes cut out in these exact locations as well. We’ll use these for our own senors. I don’t know if the earlier bumpers included these indents and cutouts. If not, you’ll have to determine the placement that works for you (see the parking assist manual for details). The BackStopper includes a special drill bit to make the holes in the plastic cover. I made a pilot hole from the backside using a 1/16″ bit at the center of these indents. I then made the final hole with the included bit. Be careful to have a wood block under the bumper – you might want a second person to hold the bumper as it’s a bit awkward to handle while drilling. Also try to protect the bumper from scratches by cleaning the area before and after drilling. Might be worth putting on some painting tape around the area to further protect the bumper. Snap each of the sensors into the holes. For me they are were a bit loose, so I removed them and with long-nose pliers bent out the tabs on the sensors slightly. The sensors have a 6 degree slant. I’m not sure it matters when way they are oriented, but I elected to have the thicker part at the bottom to make the sensors less noticeable. 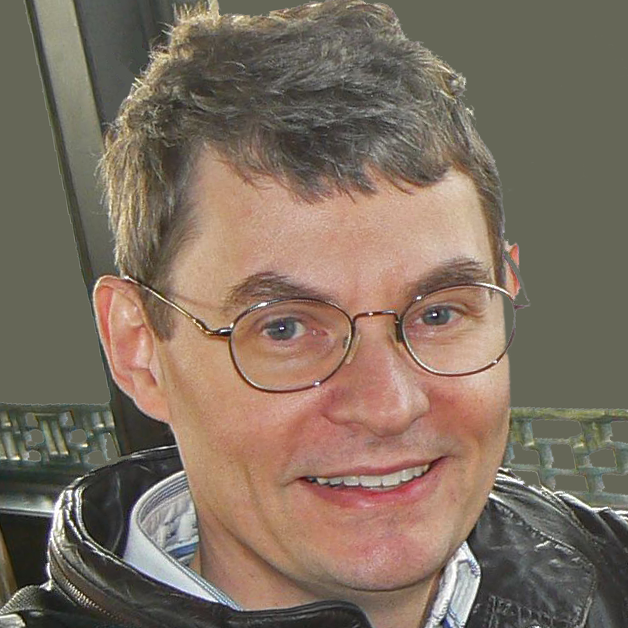 Each sensor has an associated long wire and connector. I routed these wires through the steel bumper, having about 8″ hang out each of the two holes. On the passenger side, I wrapped the two wires with two layers of electrical tape for about 5-6″ where the wire exits the steel bumper as the edges are fairly sharp. I also tie wrapped the two wires at the first hole in the bumper to keep everything in place. Feed the two wires up over the horn and into the area behind the passenger headlight where we’ll mount the controller. 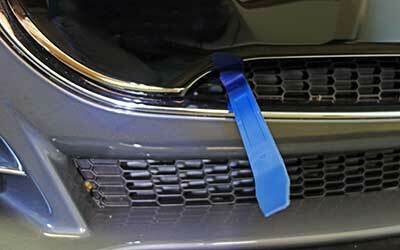 Place the bumper cover in front of the car (but not face down to avoid scratches). Connect the sensors. Now snap the cover back in place, being careful to push the excess wires into the bumper holes. The ground (black wire) and ACC+ (pink) wire will be connected up by the fuse box. You’ll need to remove the cover between the windshield and the frunk. Lift up from the windshield side and pull towards the windshield to remove the cover. You’ll see two black fuse boxes. 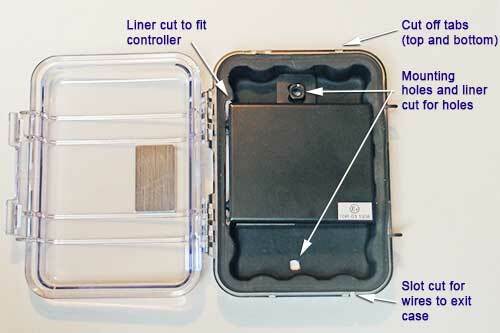 Remove the cover from the passenger side box by pressing the clips in the sides and lifting up. It doesn’t release easily. We’re lucky to have an unused ACC fuse in the box that we’ll use. 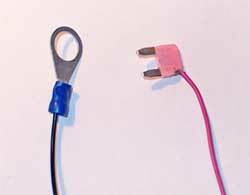 Estimate the length of the pink and black wires to get to from the controller to the fuse box (and leave at least 12″ extra). Cut the wires, and attach the crimp connector to the black lead. Take a fuse, and solder the pink wire to one side of the fuse. You may need to cut/file away a little of the plastic on one side so enough of the fuse metal is available to solder to. Once complete, pull on the wire to confirm it is securely soldered to the fuse. For the following test, temporarily remove the bolt shown below and feed the bolt trough the ground lug (black wire) and screw the bolt back in place. Insert the fuse into the location F33 (see below or refer to the Tesla Model S Quick Guide, page 27 for fuse positions). The side of the fuse where the pink wire is attached should be pointing towards the windshield. Don’t route the wires yet, as we will remove the connections after we confirm everything is working. Without mounting the controller, attach the two sensors to the F and G ports, connect the display, and connect the power connector. There are four additional wires, which we do not need yet. Leave these for now (but don’t let them short out or touch each other – the ends are bare). If the car is on, and there is something in front of the car, the display over the rear-view mirror should show some LEDs lit up. You may need to power down the car and then up. This system goes off after about 10 seconds of inactivity, and resumes when the power is cycled and/or the brake is depressed (but we haven’t yet connected the brake wire, so this function will not work yet). Confirm if the F and G connectors are correct or backwards by placing something closer to the driver side sensor and confirming the LEDs on the driver side indicate the change (or note they are backwards). With the test complete, remove all the connectors (they have tiny locks on the power and sensor connectors). When removing the F and G sensor connectors, mark them so you know which one goes into which connector (or swap them if they were backwards in the test). Remove the fuse and unbolt the black wire’s connection as we’ll need to re-route these wires later. I mounted the controller to the outside of the frunk just in front of the passenger headlight. There are very few areas available to mount this as Tesla did a great job of using every spare space! This space is not water-tight, as you’ll notice the radiator fan and openings in the tire wheel-well below this. To deal with this, I used the pelican waterproof case to enclose the controller. This area is super tight to work in, and the use of the case makes fitting this all in a bit of a challenge. If you use the case I specified above, the controller does not quite fit. The rubber insert lifts right out. You’ll need to remove some of the rubber material from the sides to make it fit into the case. I was very careful to keep the rubber around the top of the case so you’ll still get a watertight seal when it is closed. There are many ways to attach the box and controller. I used two bolts, that go through the frunk through the plastic case, through the rubber liner. One bolt then goes into the controller’s tab, and the other I just used a washer and nut. Other ways to do this include using Velcro (not sure if it will hold), or a tie wraps to something else. The box fits in a way that it still can be opened about 30 degrees when mounted. For the bolt method, I sawed off the tabs on the outside of the plastic box, as they are just in the way. For the first hole, I cut the liner with a knife where the hole was going to be (rubber is difficult to drill!) I made the first hole in the box so it aligned with the controller’s mounting nut. I then positioned the box so it fit, but still could be opened, The opening latch must clear the metal clip used to hold the large Tesla cover on. I marked the hole’s location on the back-side of the frunk. I then used a 1/16″ bit on several extensions to drill through to the other side. Once through, I then used a 1/4″ bit from the inside of the frunk to make the final hole. I then confirmed the hole worked and attached the box, controller with a big 2″ bolt (it could be shorter, but it was easier to work with a long bolt). With all that attached, I then drilled another 1/16″ hole from the frunk side into the other side of the box, holding the box in it’s final position. Once confirmed the 2nd hole is in about the right place in the box, I drilled a 1/4″ hole in the frunk without the box attached. In the plastic case I cut the rubber liner where the new hole will be, and enlarged the hole in the plastic box to 1/4″ for the bolt. Confirm that it all fits and the bolts go through and will hold it all together. Remove the box, and we’ll need one last modification to pass the wires through. Remove the controller and rubber liner. I drilled a 1/4″ hole in the side just below the lip. I then used a hacksaw to cut two slots down to the hole. This is were all the wires will pass. Put the liner back in and mark the center of the hole. Remove the liner and slice a vertical and horizontal slits at the hole, about 3/4″ long, but do not cut into the lip of the liner, as we’re trying to keep as much of the waterproof seal as we can. I wrapped up the green wire as it will be left inside the box unused. Now feed the power with the fuse and lug and other wires from the white connector (except the green wire) through the sliced part where it will pass outside the box. The four black fuses will remain inside the box when done. Pass the two sensor connectors through the other side of the slit, along with the display connector. Make the connectors to the controller. Be sure to have the F and G connectors in the right positions (otherwise the display will be backwards). Fit it all back into the box. Attach the box to the frunk with the two bolts. I also added a rubber washer between the frunk tub and the plastic box to reduce the chance of water getting into the frunk. The bolts should be firm, but don’t over-tighten or the box might break. The white wire needs to connect to the brake switch, and ideally the red wire connects to the reverse light. Getting connected to the reverse light looks to be a major pain. While I did run the red wire along with the white wire to the dashboard in the steps below, it is not necessary as I didn’t connect the wire to anything. The only purpose of the red wire is to mute the front distance alert sound when backing up. 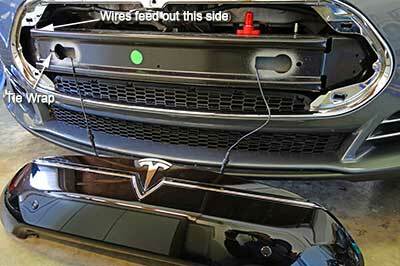 On the driver’s side, frunk, remove the Tesla side cover. Like the passenger side cover, the rubber mount must be unscrewed first. Open the driver’s door and remove the black side dashboard plastic part and lay in down (I left the FOB antenna wires attached). The thin black plastic cover that goes up to the side post also needs to be removed. Grasp in the center and pull up and out. To connect up the white wire, I routed it between the frunk tub and the fuse box and over to the driver’s side. The wire is not long enough, so I attached an extra 6 feet of black wire (which is less noticeable). You could use a wire color that matches your paint color, although it only shows for a few inches when the door is open. You can use a solderless connector or solder the joint to extend the wire. Make sure the joint is well insulated. Similar to how we routed the display wiring on the passenger side, but in reverse, it snakes along the side, and through the gap and around the driver’s door rubber molding. I also put some heat shrink tubing around the wire where it comes around the metal edge of the door as added protection from rubbing. Electrical tape could be used instead. Remove the driver side plastic sill panel. It is held in by snaps. Start at the center pillar floor area and lift up. With the sill removed it exposes two large connectors under the side of the dash. We need to tap into the brake switch wire. Look for the white wire with lime stripe at the bottom of the black connector. You may need to carefully cut away some of the electrical tape and/or carefully pull on the wire to get enough to work with. Attach a T-splice to spade connector. On our wire, crimp on an insulated spade lug. Connect the two together. 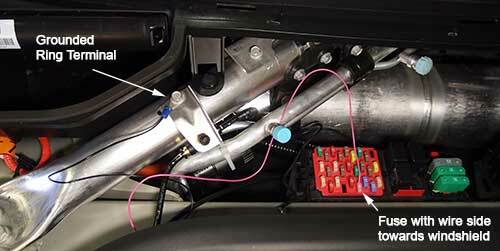 Back in the frunk area, route the black and pink wires up to the fuse box area and reconnect the black lug to the bolt and insert the fuse. Again, confirm the wire side of the fuse is pointed towards the windshield. 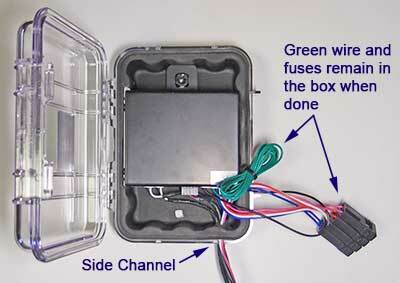 The pink wire can come out the center of the side of the box and the lid should still fit on. If you prefer you can cut a small channel in the side of the box so the wire is not pinched. On the unused red and blue wires, I cut them a bit shorter, sealed the ends (with heat shrink tubing) and coiled them up and put a tie warp around it. The display and sensor wires also will have quite a bit of excess. I coiled them up and used tie wraps as well. They can be stuffed into a space towards the passenger side away from the controller box. After a final confirmation test of the system, reinstall the three Tesla frunk covers and rubber mounts. Close the lid and you’re ready to go! The sensors are not all that visible depending on the light. This photo was enhanced so they are a bit more visible. Here’s the final result – the parking assist display shows an object very close on the driver’s side (3 inches) and something close (about 28 inches) on the passenger’s side. The display is dark when there is nothing closer than 3 feet to the front of the car. Since I didn’t use the red backup light wire, I may add a switch to the wire so that it goes between ground and +12 to mute the audio. I’ll have to see how much I like or dislike the audio alert of the Backstopper. I wonder if it might go quicker/easier to install the controller in the cabin eliminating the need for the waterproof enclosure. One possible place to install the controller would be on top of the glove box, perhaps with a screw from the inside of the glove box. This space is somewhat empty on my car, but it may be filled with some other boxes depending on what options were purchased with the car (perhaps the Sound Studio amplifier?). 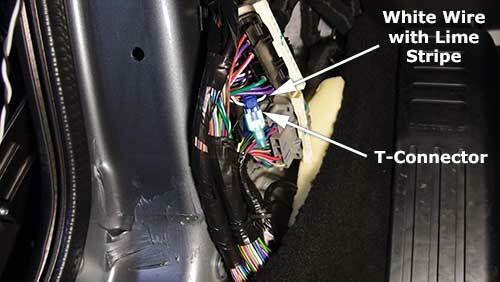 Using this approach requires more wires to be routed from the frunk area to the dashboard. This area is also difficult to work in, but perhaps no more than in the frunk area. The power might come from the 12V accessory socket, but I understand that is also difficult to connect to. It may be easier to just run the wire to the fuse box in the frunk. While taking far more effort than I expected, I’m happy with the results. I can see why shops charge $600-$1500 to install a parking assist system! I completed the install per your directions. Worded perfectly. A couple comments: 1) I used the brand you suggested. It shows closest with about 12″ left to go. Would be better if that were only an inch or 2. BTW, the kit now includes a couple side-splice fittings. 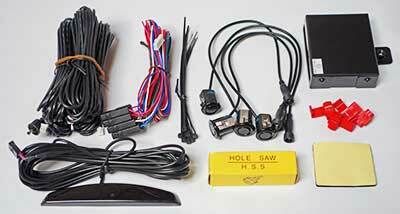 2) Why not do all the wiring from the drivers side? 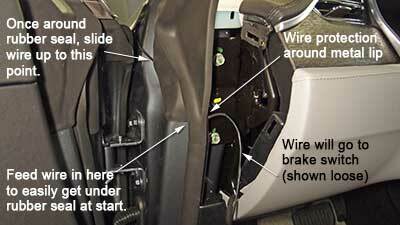 There is no reason not to use the drivers side for all wiring, and it is likely easier. I just showed the way I did it, as I was hoping to find a way through the firewall instead of going outside. If you look at the Sub-woofer installation, I finally did find a firewall grommet that can be used to run wires through the firewall. If you have the pano roof, the drain hose may go through this grommet (unconfirmed).